Looking for something fun to do over half-term? Well, The Shard is the tallest building in Western Europe and you can head to the top of the skyscraper in The View attraction. This half-term is a brilliant time to check it out as well, because kids go free at The View from The Shard from 17th February to 23rd February. Click here to find out more! Top 10 Half Term Events! 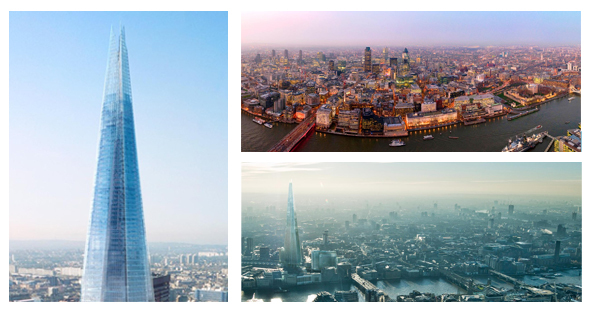 The View from The Shard gives 360 degree views of London, which means you can spot all of your favourite landmarks in the city like The Houses of Parliament, Canary Wharf, Buckingham Palace, the Olympic Park and Wembley Stadium. And because the building is so high, the view can stretch as far as 40 miles! There’s even the chance to get lots of facts and info about the landmarks from the high-tech Tell:scopes at The View. They let you zoom in on the most interesting parts of the city and give you information on whatever you’re looking at. The Tell:scopes also let you switch between day time and night time view to see how London changes throughout the day! Spot as many landmarks as you can, then you’ll be unbeatable in I Spy in High Definition. This is a gigantic game of I Spy, but instead of spotting trees and cows, you’re spotting London’s most famous buildings. To see The View for free, you must be 4 – 15 years old and be accompanied by an adult (infants aged 3 and under get free entry but do not require a ticket). Click here to visit The View and find out more or call +44 (0)844 499 7111. Time: Sunday-Wednesday, 10am-7pm (last entry time 5:30pm-6pm); and Thursday-Saturday, 10am-10pm (last entry time 8:30pm-9pm). Price: 4 – 15 year olds go free with a paying adult (infants aged 3 and under get free entry but do not require a ticket). Click here to see other prices. *Terms and conditions apply, CLICK HERE to visit The View’s website for more information.